It is convenient to use conspicuous typical plants or plant communities in judging biogeographic classifications, as evidence of definable and climatically based biological units. For example, we think of characteristic shortgrass plains species (such as buffalo grass and big sagebrush) and comparable coniferous forest species (such as ponderosa and limber pines) as reliable indicator species of the American West. Similarly, characteristic plants of the tallgrass prairies (such as big bluestem and Indian-grass) and deciduous forests (various oaks and maples) are easily recognizable species that are largely limited to eastern North America. For example, in Nebraska there are six native eastern oak species, only two of which extend beyond the relatively moist Missouri Valley of extreme southeastern Nebraska. The red oak ranges north along this well-timbered valley to Dakota County and west along the Platte Valley to Saunders County. However, the much more drought- and fire-tolerant bur oak occurs west along the Niobrara Valley to Dawes County and along the Platte Valley ranges west to Custer County. Among the maples, the moisture-loving eastern silver maple is native to riverine forests over only the eastern third of the state. In contrast, the shrub-sized and relatively arid-adapted Rocky Mountain maple barely enters the state, by eking out a marginal existence in the shady canyons of Sioux County. Similarly, big sagebrush, which probably once occupied a million or more square miles in the Old West, occurs in northwestern Nebraska only in Sioux, Dawes, and Sheridan counties. Among the western conifers, the arid- and timberline-adapted limber pine barely reaches southwestern Nebraska in Kimball County. However, the highly adaptable ponderosa pine penetrates east along the Niobrara Valley to Keya Paha and Rock counties, which was one of the reasons Charles Bessey selected Rock County as an important east-west floral transition zone. It might be impossible to define precisely the meeting point of East and West over the broad geographic, climatic, and biological gradients that exist in the Great Plains. However, there are many interesting biological situations that arise in locations where two closely related western- and eastern-oriented species meet and interact. These conditions present probabilities of overlapping ecological niches and strong interspecies competition for the same environmental conditions, as well as possibilities of interspecies hybridization. For example, the Rocky Mountain juniper extends from Nebraska’s western border counties east to Cherry County. Over part of its western Nebraska range this shrubland-adapted juniper is in contact with the more widespread and less drought-tolerant eastern red-cedar, and the two freely hybridize. For very closely related species such as these junipers, hybridization might not be harmful and conceivably might even be beneficial if the two species are able to exchange their most desirable genes. But the more distantly related two hybridizing species are, the less likely their two gene complexes can interact successfully and the more probable that the resulting hybrids will be ill-adapted to the environment and unable to breed successfully. Over time, such coexisting species ultimately evolve sufficient genetically based differences as are needed to prevent crossbreeding. While expanding their ranges, plants and animals often travel via convenient natural corridors, along which they can survive, reproduce, and disseminate progeny into new areas of dispersal. In Nebraska, the primary north-south wooded corridor has probably been the Missouri River. Strongly forest-dependent birds such as the blue-gray gnatcatcher, eastern whip-poor-will, chuck-will’s-widow, and pileated woodpecker are examples of eastern forest-breeding birds that have been expanding northward along this narrow riparian corridor during historic times. 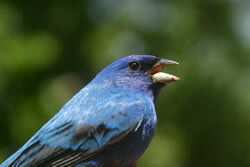 Likewise, breeding by other eastern birds such as the Acadian flycatcher; Kentucky, prothonotary, and yellow-throated warblers; Louisiana waterthrush; summer tanager; and tufted titmouse is now mostly limited in Nebraska to the mature, usually moist, forests of its central and southern Missouri Valley. These species have shown little if any apparent recent breeding expansions, probably because of having specific niche requirements not easily found elsewhere. Among plants, there are similarly many characteristic Missouri Valley species that probably are unable to adapt and expand into the nearby upland forests, including trees such as the American hazel; bitternut and shagbark hickories; black cherry; ironwood; pawpaw; and rock elm. Some of the many forbs with similarly restricted Missouri Valley distributions include the gray-headed coneflower, Indian-pipe, late boneset, pale touch-me-not, showy and yellow orchids, smooth blue and willow asters, Turk’s-cap lily, and wild columbine. Nebraska has several major river valleys, notably the Niobrara, Platte, and Republican, which offer opportunities for east-west riverine corridor movements. Considering only woodland or woodland-edge species, the American redstart and black-and-white warblers, ovenbird, and red-breasted nuthatch are largely restricted along the Niobrara River to a narrow east-west corridor. The limited availability of coniferous habitats may prevent the nuthatch from any future range expansion any farther east, just as limits on fairly cool and shady deciduous canopies may prevent the two warblers from extending much farther west. 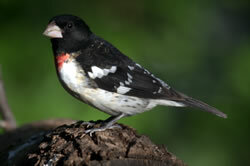 Many of Nebraska’s woodland songbirds have similar strong distributional affinities with both the Platte and Niobrara rivers. Those species that are rather loosely dependent on a well-wooded corridor, and that can also use smaller riparian and nonriparian woody habitats for breeding, are most widespread and most common. 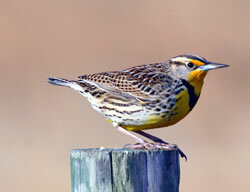 Several examples of these include species-pairs, having both eastern and western relatives whose ranges were split during late glacial times, as tundra and grasslands expanded over the Great Plains. As wooded corridors across the plains have recently matured in the absence of frequent prairie fires, these species’ expanding ranges have increasingly approached one another, and now many of them are in geographic and social contact. 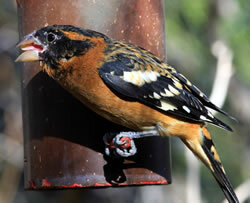 Four major species-pairs with interacting eastern and western counterpart birds (the western forms listed first) are the Bullock’s and Baltimore orioles, the lazuli and indigo buntings, the black-headed and rose-breasted grosbeaks, and the spotted and eastern towhees. The common ancestral populations of all these species-pairs were probably separated into western and eastern isolates during late Pleistocene times, and it is only recently that climatic and ecological changes have brought them together. In areas where these species geographically overlap, the presence of mixed matings and occasional hybrids is of great interest to biologists. Depending on the incidence of hybridization, and the relative reproductive fitness of hybrid offspring, it is possible to judge the degree of evolutionary divergence between the parental stock. If the hybrids are unable or less likely to reproduce, putting them at a disadvantage with nonhybrids, the two parental populations are best considered as genetically isolated species. Such is the case with all eight of the bird species just mentioned. 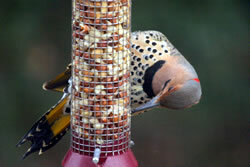 In contrast, the red-shafted (western) and yellow-shafted (eastern) populations of the northern flicker have also come into relatively recent broad contact across much of Nebraska and elsewhere in the Great Plains. There they have thoroughly interbred, producing a variety of intergrades and blurring their genetic differences to the point that they are now classified as a single species. During the current trend toward global warming, plant and animal ranges will continue to change, and extinctions of some species might occur. Bird species that have recently expanded into Nebraska from the south include the glossy ibis, cattle egret, white-winged dove, Eurasian collared-dove, and great-tailed grackle. Some tropical species that are now appearing in small but increasing numbers include the black-bellied whistling-duck, Neotropic cormorant, and Inca dove. Additionally, several birds that once regularly overwintered in Nebraska, such as the Bohemian waxwing and snow bunting, now increasingly winter farther north. In the central Great Plains, we can anticipate that a progressively warmer and drier climate will develop, unless effective international controls on carbon consumption are adopted. In Nebraska, we can also expect more recurrent droughts and reduced water availability through excessive drawdowns of our aquifers and declining surface waters. Thus, in the near future, homeowners should plant buffalo grass rather than Kentucky bluegrass and yuccas rather than roses. When planting trees, drought-tolerant species, such as bur oaks, are far better choices than more thirsty species, such as maples. Nebraskans should also not be surprised to encounter armadillos in their backyards, and some day might begin seeing black vultures overhead, as a somber harbinger of hotter and drier days ahead. Paul Johnsgard’s revised edition of The Birds of Nebraska (2013)—a summary that conforms closely to the Nebraska Ornithologists Union’s “Official List”— is a good resource for bird identification and hybridization. It is available from Amazon.com and Lulu.com. Bessey, C. E. “A Meeting Place of Two Floras.” Bulletin of the Torrey Botanical Club 14 (1887): 189–191. Kaul, R., D. Sutherland, and S. Rolfsmeier. The Flora of Nebraska. Lincoln: School of Natural Resources, University of Nebraska–Lincoln, 2006. Johnsgard, P. A. 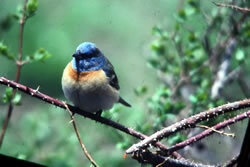 Global Warming and Population Responses among Great Plains Birds. University of Nebraska Digital Commons, 2015. http://digitalcommons.unl.edu/zeabook/. 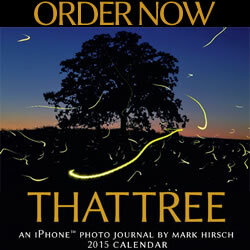 Print edition available from Lulu.com.